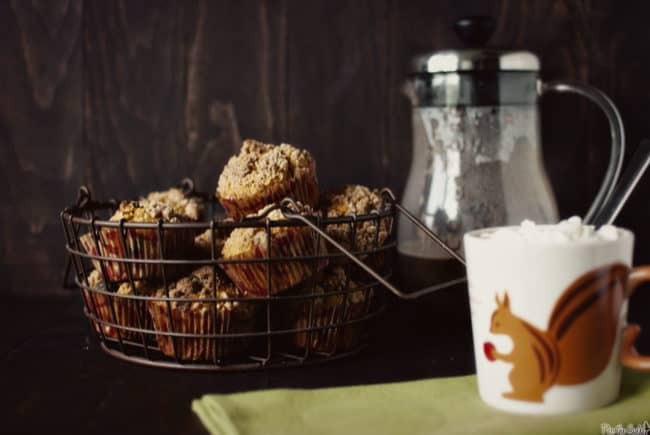 Chocolate chip pumpkin muffins are the perfect treat on a fall morning. 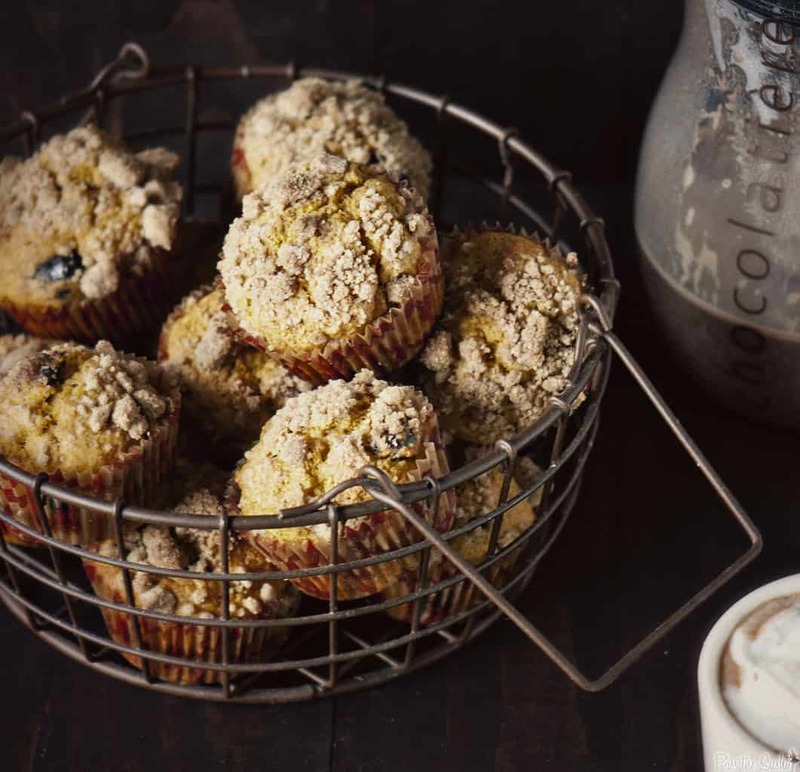 With lots of chocolate chips and a topping of crumbly streusel, these muffins can also become the perfect dessert. You know what I smell? Well besides stuffing, turkeys and brisk leaves in the air. I smell a bunch of secret recipes about to be revealed today. That’s right, it’s Secret Recipe Club* day and this month I got to be a stealthy little ninja over at Melissa’s Cuisine. She cooks because she enjoys it and runs to keep it off. Wait, did I pick up mountain biking this year? And she’s got a pup named Champ. We all know the infamous Marble. I’m digging on the similarities here, can you tell? *What’s Secret Recipe Club you fandangled young hipsters with your interwebs and blog hoppers? Only a huge shindig where you are assigned a blog to sneak about, choose a recipe from, and post at a specific time on a specific day. You get to be stealthy and discover new blogs. Not a bad deal. Oh, and I smell chocolate chip pumpkin muffins, too. Preheat oven to 400 degrees F and line with paper liners or grease a muffin tin. In a small bowl, using a fork or your fingers, combine the ingredients for the streusel topping (butter, brown sugar, and flour) until crumbly and pea sized lumps remain. Set aside. In a bowl combine your dry ingredients, flour, sugar, baking powder, cinnamon, nutmeg, and salt. In another bowl, whisk together the pumpkin, butter, and eggs until combined. Gently add the dry ingredients until just combined, taking care not to over mix (not over-mixing is the secret to a great muffin). Fold in the chocolate chips. Using a large ice cream scoop, fill each muffin tin about 2/3 full. Sprinkle with streusel topping and pat each gently. Don’t skimp here or you’ll be streusel-less when you pull these babies out of the oven and that just makes me sad. Slide the muffin tin into the oven and bake for 22-25 minutes, or until a toothpick inserted in the center comes out clean. Now, be honest. Can any one else not say muffin without getting Aerosmith stuck in their head? Because it’s been there for days for me…. days…. I am loving that wonderful, crumbly topping on those muffins! I love pumpkin with chocolate. They look fabulous!! As a non-pumpkin “lover” (I know you concur!) these look GREAT! I also LOVE that mug??? The thing with the squirrel… whatever it is… want it! 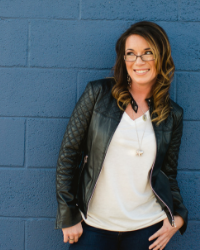 I just fell in love with you and all it took was the word ‘Aerosmith.’ I know, I know, it should have been about the food but a) they’re my second favorite band and b) I ALWAYS get a song stuck in my head like that. Yes, the muffins are gorgeous (and your photography makes them doubly so). beautiful pictures! Love the basket for the muffins. I put chocolate chunks in my pumpkin bread and that was delicious, so with the streusel topping, these have got to be doubly good! Great treat for this time of year. Pumpkin and chocolate is so very good, plus these photographs are just gorgeous. Chocolate covered cranberries… YES PLEASE! Love the smells of the holidays. These muffins sure wouldn’t stay a secret long. These look great. I especially love the crumble topping — wins me over every time. Lovely Muffins! What a great blog you got for SRC. You picked a wonderful recipe. Thanks for sharing. Nom. Those look good, pumpkin chocolate chip is awesome. Also, your pictures are excellent. Pumpkin muffins are a favorite around this house. I like the chocolate covered cranberrie idea. The best of all worlds! Those look so darn good, great pics too. LOVE that streusel topping. 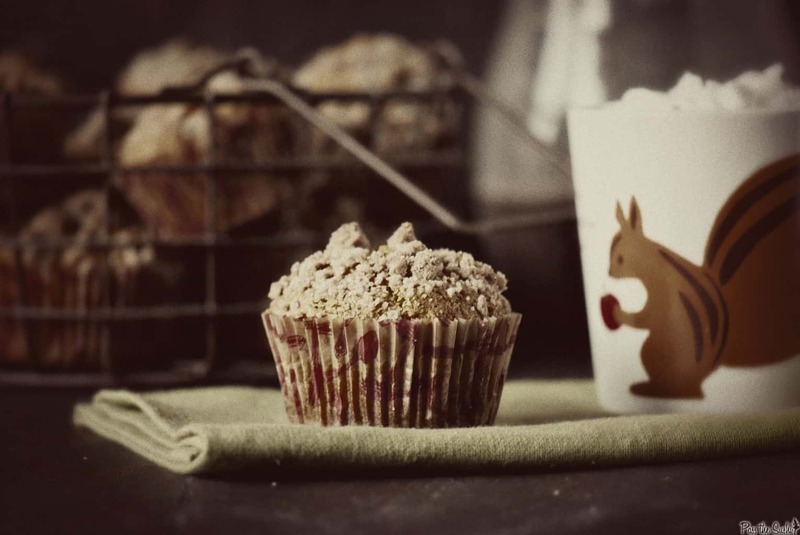 Delicious muffins…and these photos are awesome! That last picture is really lovely! Love love love these, Kita! Great SRC pick. And I really love the pictures, especially that squirrel mug!! These are terrific! They’d be a perfect Thanksgiving breakfast with a cup of coffee! Wonderful photos – as always! I absolutely love your struesel topping and I know already this part will make me very addicted. Looks really delicious and I love the wire basket! You got a great blog and made the perfect choice in recipes. I am loving the topping on these. And your pictures are breathtaking as always. That mug is so adorable. Oh … I’m adding this recipe to my “to make” list immediately! Great pick for SRC! This looks so good~I love the topping! !